More than 30 million Americans suffer from osteoarthritis making it one of the most common age-related diseases. Now, a study from scientists at The Scripps Research Institute (TSRI) explains why the risk of osteoarthritis increases as we age and offers a potential avenue for developing new therapies to maintain healthy joints. The study's findings suggest that FOXO proteins are responsible for the maintenance of healthy cells in the cartilage of our joints. "We discovered that FoxO transcription factors control the expression of genes that are essential for maintaining joint health," says Martin Lotz, MD, a TSRI professor and senior author of the study, published today in the journal Science Translational Medicine. "Drugs that boost the expression and activity of FoxO could be a strategy for preventing and treating osteoarthritis." Previous research from Lotz' lab showed that as joints age, levels of FoxO proteins in cartilage decrease. Lotz and his colleagues had also found that people with osteoarthritis have a lower expression of the genes needed for a process called autophagy. Autophagy ("auto" meaning "self" and "phagy" meaning "to eat") is a cell's way of removing and recycling its own damaged structures to stay healthy. 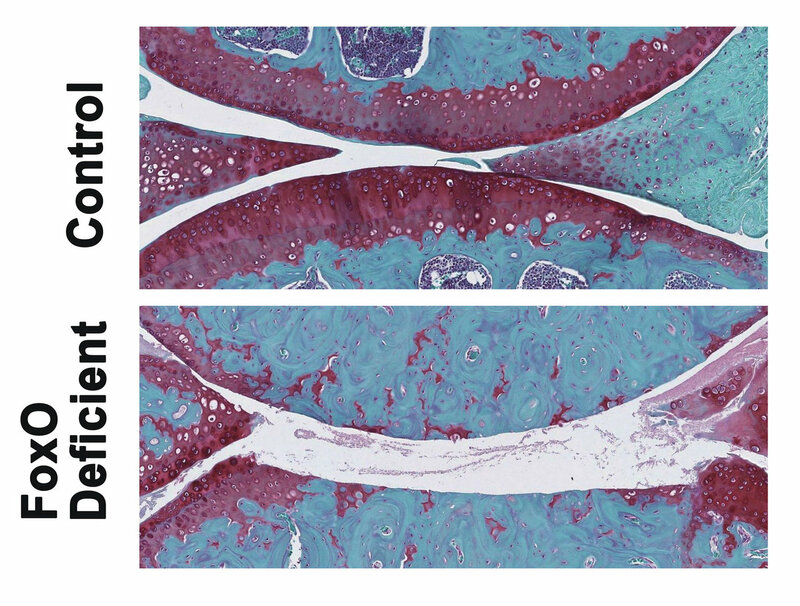 For the new study, researchers used mouse models with FoxO deficiency in cartilage to see how the FoxO proteins affect maintenance of cartilage throughout adulthood. The researchers noticed a striking difference in the mice with "knockout" FoxO deficiency. 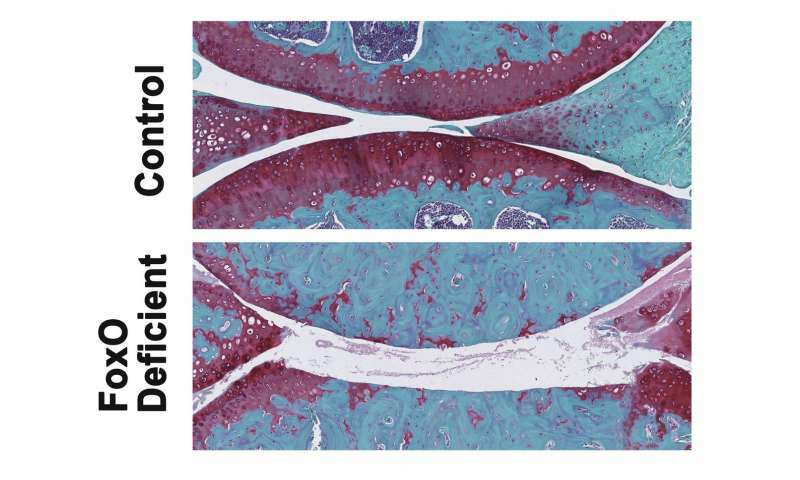 Their cartilage degenerated at much younger age than in control mice. The FoxO-deficient mice also had more severe forms of post-traumatic osteoarthritis induced by meniscus damage (an injury to the knee), and these mice were more vulnerable to cartilage damage during treadmill running. The culprit? The FoxO-deficient mice had defects in autophagy and in mechanisms that protect cells from damage by molecules called oxidants. Specific to cartilage, FoxO-deficient mice did not produce enough lubricin, a lubricating protein that normally protects the cartilage from friction and wear. This lack of lubricin was associated with a loss of healthy cells in a cartilage layer of the knee joint called the superficial zone. These problems all came down to how FoxO proteins work as transcription factors to regulate gene expression. Without FoxO proteins running the show, expression of inflammation-related genes skyrockets, causing pain, while levels of autophagy-related genes plummet, leaving cells without a way to repair themselves. "The housekeeping mechanisms, which keeps cells healthy, were not working in these knockout mice," Lotz explains. To determine whether targeting FoxO has therapeutic benefits, the investigators used genetic approaches to increase FoxO expression in cells of humans with osteoarthritis and found that the levels of lubricin and protective genes returned to normal. The next step in this research is to develop molecules that enhance FoxO and test them in experimental models of osteoarthritis.